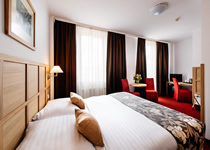 The 3* Central Hotel in Prague is located in a quiet area of the Old Town, just 2 minutes walk from the Old Town Square and 5 minutes from Wenceslas Square. The Central Hotel has 51 comfortable, welcoming rooms. It is a popular hotel, often with unbeatable rates for the standard of accommodation in such a central position. Rooms are fully furnished with a modern en-suite bathroom & WC, towels, hair-dryer, safe, telephone, Satellite TV and free Wi-Fi. Café Bar Central at the hotel offers beers, wines, sparkling wines, spirits, cocktails, and hot and cold soft drinks. Sports matches are shown on a plasma TV screen. There are also restaurants, cafés and bars to discover all around the hotel in the Old Town (see 'Nearby Places' for restaurant recommendations). Secure underground parking is available nearby at 30 EUR per night.